DNA barcoding—sequencing a standard region of the mitochondrial cytochrome c oxidase 1 gene (COI)—promises a rapid, accurate means of identifying animals to a species level. This study establishes that sequence variability in the barcode region permits discrimination of 98% of 201 fish species from the Canadian Pacific. The average sequence variation within species was 0.25%, while the average distance separating species within genera was 3.75%. The latter value was considerably lower than values reported in other studies, reflecting the dominance of the Canadian fauna by members of the young and highly diverse genus Sebastes. Although most sebastids possessed distinctive COI sequences, four species did not. As a partial offset to these cases, the barcode records indicated the presence of a new, broadly distributed species of Paraliparis and the possibility that Paraliparis pectoralis is actually a species pair. 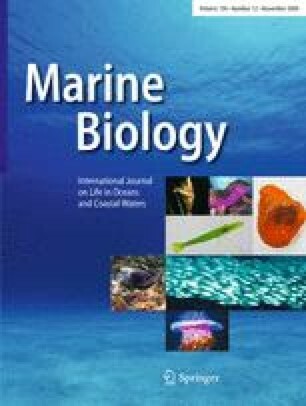 The present study shows that most fish species in Pacific Canadian waters correspond to a single, tightly cohesive array of barcode sequences that are distinct from those of any other species, but also highlights some taxonomic issues that need further investigation. The online version of this article (doi: https://doi.org/10.1007/s00227-009-1284-0) contains supplementary material, which is available to authorized users. This study was supported by the Canadian Barcode of Life Network through funding from NSERC and Genome Canada through the Ontario Genomics Institute. We thank the Canadian Department of Fisheries and Oceans and the Canadian Coast Guard for ship time and other support during the cruises where specimens were collected. We also thank Ken Fong, Graham Gillespie, Gavin Hanke, Katy Hind, John Klymko, and Dennis Rutherford for help with specimen collections and Mark Stoeckle for sharing his idea of the half-logarithmic do plots for genetic distances.